Ubaldo Jimenez might be the most physically gifted pitcher in Major League Baseball. The 27-year old pitcher from the Dominican Republic possesses a fastball that can touch 100 mph, an almost identical looking, yet much slower changeup, a slider that bursts across the plate and a curveball that seems to shoot down an elevator shaft. Jimenez’s pitches move so much at times that he has trouble controlling them, walking 3.9 batters per nine innings in his career. Throughout his career, the question about Jimenez was not whether he had the ability to pitch, but whether he would be able to learn how to become a pitcher, and not a thrower, on the mound. After a 2010 season in which he led the National League in winning percentage and finished third in the NL Cy Young voting, going 19-8 with a sparkling 2.88 ERA in 221.2 innings, many thought Ubaldo Jimenez would take another step forward towards living up to his potential and becoming one of the best pitchers in baseball. Jimenez continued to improve upon his win, inning, strikeout and ERA totals, which he has accomplished in each season since his rookie year with the Colorado Rockies in 2007. Entering the prime of his career, 2011 was supposed to be a year that made Jimenez the talk of baseball for his work from the pitching rubber. Instead, it has turned into a year that started with disappointment and is now filled with swirling rumors about where he might end up by the end of the MLB Trade Deadline on July 31. Jimenez’s season did not get off to a great start. A couple of days after allowing five earned runs in six innings in an Opening Day loss to the Arizona Diamondbacks, Jimenez was placed on the disabled list with a thumb injury. He returned on April 19, and continued to struggle. In nine starts through the first two months of the season, Jimenez went 0-5 with a 5.86 ERA while walking 30, striking out 45 and allowing 47 hits in 50.2 innings. The beginning of his 2011 season was in sharp contrast to the beginning of his 2010 season, where in the first two months, Jimenez made 11 starts, going 10-1 with a 0.78 ERA, 26 walks allowed, 46 hits allowed and 70 strikeouts. It took a complete game shutout for Jimenez to turn around his season on June 1 against the Los Angeles Dodgers. In June and July, he has a record of 6-3 with a 2.58 ERA while striking out 63 and allowing 15 walks and 61 hits in 66.1 innings. The 15 walks Jimenez has surrendered in his last 10 starts are significant. He is showing much more control and command of his pitches on the mound, walking just 2.03 batters per nine innings, which is well below his career average of 3.9. Jimenez’s successful summer months are not due to luck; Opponents’ batting average on balls in play is right near that league average of .300, as they have a BABIP of .302 during this time. It appears Jimenez may finally be showing what he is capable of as a pitcher on the mound, not only as a thrower with tremendous stuff. 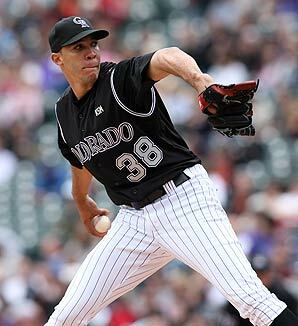 With Ubaldo Jimenez regaining his ace form while entering the prime of his career, it would seem as if the Rockies would want to do anything they could to keep him in a Colorado uniform, especially considering that they have him under contract for a reasonable price through the 2014 season. However, the Rockies have decided to shop him around near the trading deadline, making his future with the team uncertain. As many as 17 other teams have sent scouts to see Jimenez pitch. It is not hard to see why. If the Rockies are willing to trade an ace who is entering his prime with a reasonable contract, teams will jump at the chance to take him off of their hands. The Rockies, though, would be foolish to trade Jimenez now, or in the near future. While he struggled during the first two months of the season, potentially due to pitching with a thumb injury that may not have been fully healed, he has turned around his season with a stellar June and July. It is easy to see why so many teams are sending scouts to see Jimenez pitch. Now that he seems to be completely healthy, Jimenez has answered the question that has always haunted him during his career. He has harnessed his incredibly powerful and filthy arsenal of pitches, walking much fewer hitters than he has in the past and learning how to pitch, not throw, on the mound. Other teams are salivating at the shot to trade for Jimenez. Colorado has finally found an ace who has mastered the thin air and high altitude of Coors Field to lead their staff. They must keep him in a Rockies uniform to be a serious contender in the National League West for years to come. His total 2011 numbers do not tell the story. Ubaldo Jimenez has continued to develop as a pitcher, and proved throughout the past two months of the season that he is one of the best pitchers in baseball.